So technically this isn't the true "Before" on this desk, since in all actuality, I'd already refinished it with Annie Sloan Old White. But it just didn't *feel* right. So it sat. And things sat on top of it. It actually lived for a while under my work cabinet and housed various sandpaper sheets and drawer pulls, waiting for inspiration to strike. Then one day, inspiration hit in the form of some blue glass knobs I found on Etsy. If you haven't shopped on Etsy, you're in for a whirlwind. You can find anything on Etsy - and I mean anything. This weekend I found unicorn-rainbow-robotic-tyrannosaurus-rex yoga pants. They were labeled as, among other things, Christmas leggings. I want to drink the egg nog at that family's Christmas reunion! But I digress. As it turned out, the white desk and blue knobs still wasn't working for me. 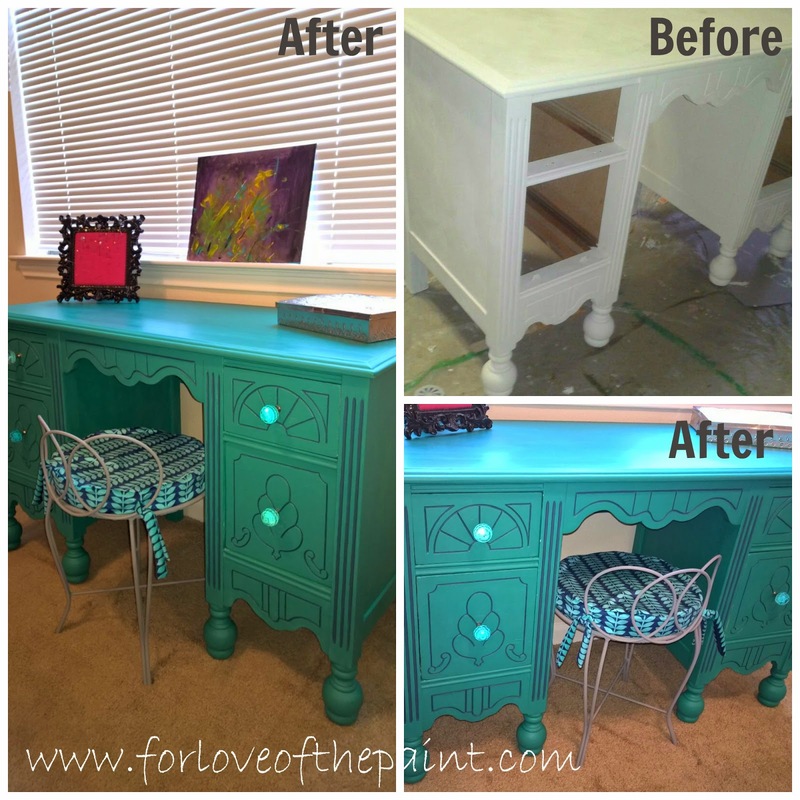 Then along came a friend of mine who envisioned a shabby chic, distressed look with Florence chalk paint. She decided she wanted to really accent the hand-carved details, so I used Aubusson Blue in the recessed area. We started to distress one of the legs, and she decided she preferred this graphic, bold look instead. This totally doesn't sound like me at all (just 100%), so we changed plans and repainted the leg! Since she really loved the color this way, I didn't wax finish the piece (this step intensifies and deepens the color). Instead, I ordered some matte polyurethane that gave a soft look and feel, but preserved the brightness of the hue. I'm loving the bold update! And we made a super cute coordinated chair cushion with some fabric that just-so-happened to match exactly.. it was clearly meant to be!